"Through the underwater diving equipment, people can join hands with nature, to enrich both of them." This is part of our policy. The products developed and manufactured in-house as apollo brand have been supported from divers in commercial diving to pleasure diving of all over the world. Developing, manufacturing, and supplying scuba diving equipments to the diving industry. Developing manufacturing, and supplying wetsuits & Dry-suits to the diving industry. Developing and manufacturing specialized airtight suits for specific applications. Developing and manufacturing underwater breathing equipment for commercial use. Developing and manufacturing spacesuits for specific government organizations. Developing and manufacturing equipment for use in experimentation apparatus in Scientific laboratories. 1965- Apollo sports started to develop and manufacture a wide range of diving equipment for both the local and international market. 1988- We launched our first underwater vehicle the av-1 More than 30,000 units were sold worldwide. 1998- The apollo Bio-Fin was developed and then manufactured. The Bio-Fin was the first fin in the world to be released to the scuba market using a completely new design and technology (now know as split fin technology)..
2003- We launched a new underwater vehicle the av-2. The av-2 incorporated new motor and battery technology that was now available. After the success of the av-2 we further developed the underwater vehicle and produced the SVX ELITE underwater vehicle. The SVX is an extended range vehicle for special applications where a long dive time was required. 2007- Nippon Sensuiki Co., Ltd was formed. Nippon Sensuiki Co then took over apollo sports distribution, products, customers and technologies. 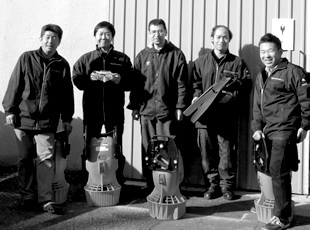 2008- Nippon Sensuiki Co attained, ISO9001:2000 which can be authenticated by Bureau Veritas and UKAS. 2013- We launched a new underwater scooter "avx". It has high power and long cruising range.